The Patrimony Traditionnelle “Calibre 2755” belongs to the super-complication category as a worthy heir of Vacheron Constantin’s 250th anniversary masterpiece and as the ultimate demonstration of its unequaled skills. In fact, this incomparable timepiece harbours three of the most sophisticated complications in the universe of high-class watchmaking: the tourbillon, the perpetual calendar and the minute-repeater. Such a revelation of the quintessence of the watchmaker’s art provides the most accomplished expression of that art and its three score of associated crafts that are in daily practice at Vacheron Constantin. As the descendant of the Tour de l’Ile watch, the exceptional and much noticed flagship watch of the brand’s 250th anniversary in 2005, the Patrimony Traditionnelle “Calibre 2755”, took three years of development and thousands of hours of work to get right. 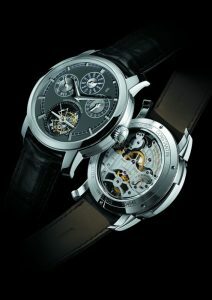 It is the most complicated model in Vacheron Constantin’s current catalog. 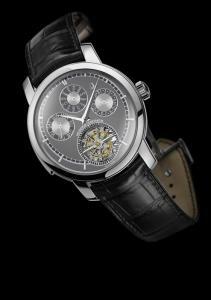 Its movement consists of no fewer than 602 parts fitted into a diameter of 33.30 mm only 7.90 mm high. This feat of true prowess also delivers more than 55 hours of running time, indicated through the sapphire-crystal caseback. Among its three complications, the minute-repeater is undoubtedly the one handled in the most original way, as if yet another demonstration that Vacheron Constantin remains one of the world’s most inventive manufacturers were strictly necessary. Caught between the desire to extend the frontiers of technical possibility and concern over the practical use of this multi-complication timepiece, Vacheron Constantin’s engineers and watchmakers came up with an original device to regulate the repeater’s chiming rate: a centripetal governor. During the development of the movement for the Tour de l’Ile anniversary watch of 2005, Vacheron Constantin’s engineers and watchmakers sought to replace the strike’s escapement governor with a totally silent system that would reduce wear. A centrifugal governor existed, essentially a flywheel with a pair of weights that moved away from the centre as it spun to slow the wheel by increasing its inertia. Nevertheless, true to the tradition of a brand whose motto recalls that it is always possible to do better, Vacheron Constantin’s watchmakers preferred to steer their choice towards a centripetal strike governor. This device has two weights shaped so as to act as a brake on the governor’s rotating shaft, thus evening-out the energy released by the repeater’s spring. To achieve this, it uses the opposite centrifugal and centripetal forces. When the governor spins, the centrifugal force pivots one end of the weights outwards so that the other end acts as a brake on the central shaft to bring the rotation and the strike to a steady rate. This original and undoubtedly unique device is quite silent. The enthusiast can satisfy his curiosity while marveling at the spinning governor through the sapphire-crystal caseback. In addition to its minute-repeater, the Patrimony Traditionnelle “Calibre 2755” features a tourbillon, which, apart from its function of equalizing the effects of gravity on different positions of the balance, offers the visual attraction of an exposed mechanism that allows the beating heart of the watch to be observed. The perpetual calendar, which holds the future in its mechanical memory, tracks the meanderings of the Gregorian calendar without intervention apart from resetting the date every 400 years. Vacheron Constantin not only entirely developed the Calibre 2755; it was also manufactured in its workshops, apart from standard parts. Each component is made with a margin so that the specialists who assemble and adjust them can remove material to introduce the right amount of shake. This procedure, which is in perfect keeping with the tenets governing the design and manufacture of the great horological complications, ensures the best possible performance and makes each movement unique. Once assembled, the Calibre 2755 beats at a frequency of 18,000 vibrations an hour and has a power reserve of about 55 hours. The level of its finish can be appreciated in the painstakingly chamfered edges of the bridge plates adorned with Côtes de Genève, the circular graining on the baseplate and the rounding-off of the tourbillon bridge. The high-status Hallmark of Geneva on the movement denotes its compliance with the twelve requirements of this independent and legally sanctioned label of workmanship, provenance, accuracy, durability and watchmaking proficiency. This amazing calibre is fitted in a generously proportioned platinum case, 44 mm in diameter and designed to achieve the most remarkable quality of sound from the minute-repeater. The optimal tuning of the strike is made possible by the ingenious use of the blocks to which the chimes are attached. The rest of the exterior has also benefited from multiple refinements: dials available in silvered or slate finishes, and the folding clasp in 950 platinum with a half Maltese Cross. Noteworthy also is that the dial is shifted slightly off-centre to better display the tourbillon carriage. Minute-repeater, tourbillon, perpetual calendar: bringing the three major complications together in a single timepiece remains a rare exercise in style and mastery. Its complexity severely limits the number of Patrimony Traditionnelle “Calibre 2755” platinum watches that can be produced.